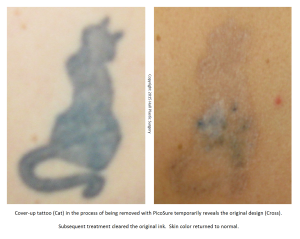 Much of the PicoSure laser tattoo removal I perform is on cover-up tattoos. Sometimes I get asked if this will make any difference in the overall removal. The short answer is “no” but there can be some interesting complexity to it. For example, was the original tattoo made in a friend’s garage using a home-brewed ink? If so, the ink from the original tattoo may be more (or less) difficult to remove than the professional ink used in the cover up. Why? Because each type of ink utilizes different ingredients, pigments and additives. Think of it like the difference between pen and pencil; a pen is much tougher to erase than pencil. Occasionally, as in the example below, the cover-up tattoo will come off first and reveal all or part of the original design beneath it. Regardless, all of the ink will eventually be removed, albeit in layers. Cover-up tattoo in the process of removal. The layering of several differing inks can affect the speed of removal. Remember that PicoSure laser tattoo removal is a physical process not a chemical process; there is no known chemical that can dissolve tattoo ink once it is in the skin. It can take the body quite a while to physically engulf, absorb and remove millions of shattered ink particles. In fact, I’ve documented two patients who continued to fade for over a year following their last treatment with PicoSure – both had moved away and later returned to Austin. If you have a cover-up tattoo you would like safely and effectively removed with the PicoSure laser I can be reached by phone @ 512-479-9997 or just stop by my NEW location in Austin, TX: Austin Medspa on W. 6th St.